Static helix mixers are widely used in the chemical industry for in-line blending of liquids under laminar flow conditions. Geometric modification of their elements can yield significant improvements in mixing performance. In a project for Sulzer Mixpac, a leading provider of mixer technologies, DATADVANCE determined the optimal geometric parameters for a helix mixer that yield minimal pressure drop together with best mixing performance. Design of the mixer was governed by five parameters: number of convolutions t, length of one total rotation h, length of one element L, element thickness s, and angle α of two elements to each other. CFD simulation of two liquid phases was carried out with the FlowVision system. 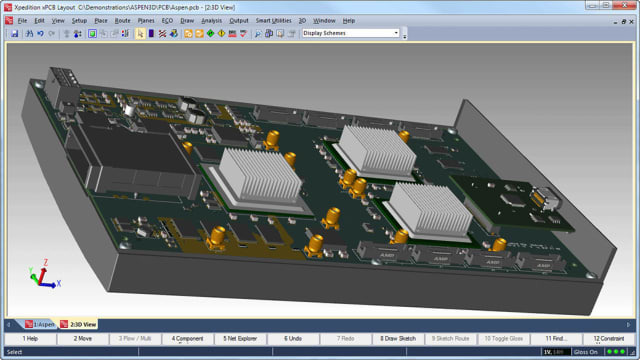 DATADVANCE’s pSeven software platform was used for CAD/CFD tool integration, design optimization, and post-processing of the results. Surrogate-based optimization (SBO) was used to solve the two-objective optimization problem with computationally expensive objective functions, minimizing the number of numerical simulations required. Key advantages of the SBO method in pSeven include minimizing the number of expensive computations needed, global minima localization, noise stability, error (NaN) handling, and a user-defined calculation budget. Total number of simulations was set to 110, based on a total optimization time limit of three days. The SBO technique generated a Pareto frontier showing pressure drop vs. mixing efficiency which clearly demonstrated how the initial geometry could be significantly improved: pressure drop could be decreased by a factor of 2.5 at the same mixing quality as the initial configuration, while mixing quality could be increased by at least 20% at the same pressure drop as the initial configuration. Additionally, parameter sensitivity analysis was performed to estimate how variations in the function output could be attributed to variations in the function inputs. An adaptive design-of-experiment algorithm based on the Gaussian process technique was used to improve the approximation function quality in the area of interest. Only 20 simulations in addition to the optimization dataset made it possible to decrease the median value of relative error in the adaptive DOE area by 1.4. An imported approximation function was used to determine the optimal angle between elements and the minimal value of DF (fractal dimension, at optimal angle) for different convolution numbers t.